Search for Connections Business Directory Anniversary and Birthday Emails. Configure the display of the content block. 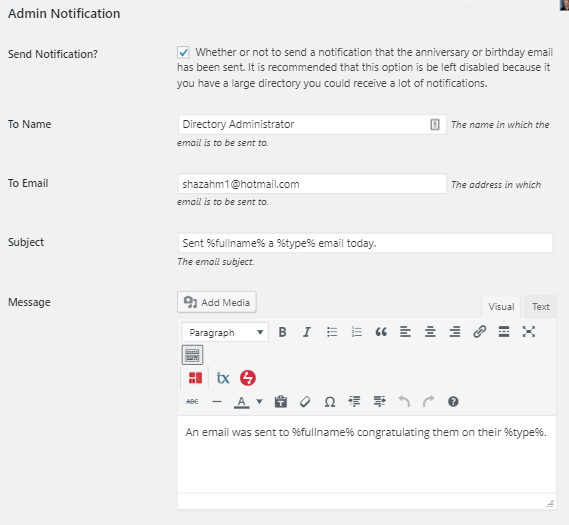 To configure the options for this extension navigate to the Connections : Settings admin page and click the “Anniversary and Birthday Email” tab. All options for this extension are found under this tab. 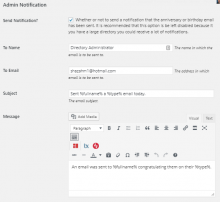 This option allows you to determine which event notification email that you wish to have sent. You can choose the send anniversary or birthday email or both. To Name :: This is the name of the individual who is to receive the admin notification email. To Email :: This is the email address of the individual who is to receive the admin notification email. Subject :: This is the subject of the admin notification. You can use the email template tags in this field. Message :: This is the message body of the admin notification. You can use the email template tags in this field. 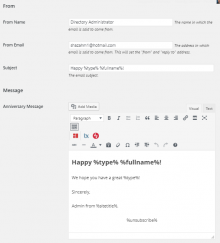 This section of settings allows you to configure the email sent to the user on their anniversary or birthday. 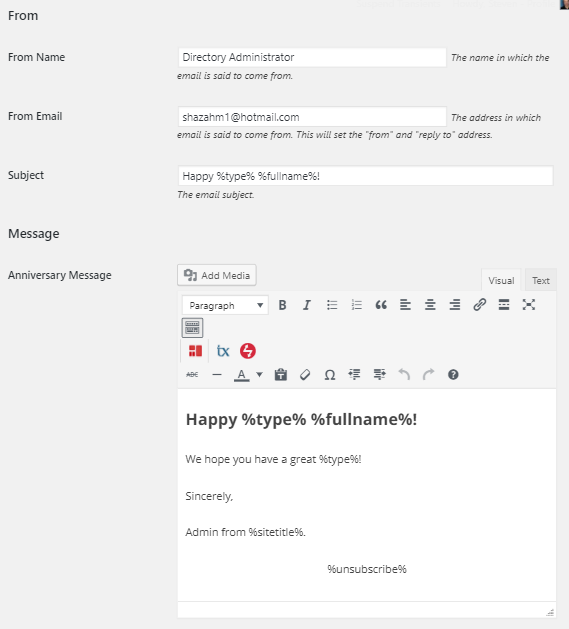 The From Name, From Email and Subject option are shared between the anniversary and birthday email. You can configure a different message for each event type using the corresponding message option. From Name :: This is the entry name of the individual who is to receive the event notification email. From Email :: This is the entry email address of the individual who is to receive the event notification email. Anniversary Message :: This is the message body of the anniversary notification. You can use the email template tags in this field. Birthday Message :: This is the message body of the birthday notification. You can use the email template tags in this field. %sitetitle% — Will be replaced with the Site Title. %type% — Will be replaced with the event email type, eg. “Anniversary” or “Birthday”. %fullname% — Will be replaced with the entry’s full name. %firstname% — Will be replaced with the entry’s first name. %lastname% — Will be replaced with the entry’s last name. %unsubscribe% — Will be replaced with the unsubscribe link. Number of Days :: The number of days before the event to send the email. Enter 0 to have the email sent on the day of the event. Time to Start :: Specify the hour of each day in which to start sending email. Valid input is 0–23 where 8 means start sending email starting after 8:00 am. Email per Batch :: The number of emails to send per batch. Batches will be sent once per hour.